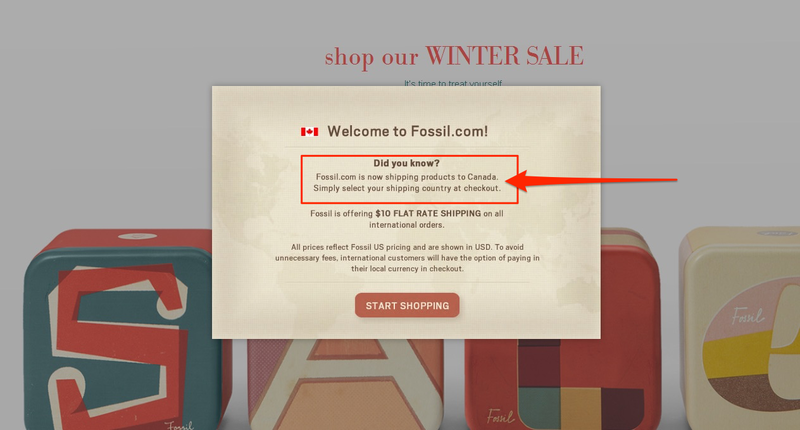 Interrupting your Black Friday shoppers’ visit with a pop-up could actually boost your sales. Because I’ve seen it working over and over and over again. And in this post, I’ll show you 5 popup strategies that will help boost your Black Friday sales. If there’s one thing that’s certain about your Black Friday shoppers is that they will be in a rush. Not wanting to miss out on any deals, many of them will visit your website at work, or anywhere else where they won’t be able to focus entirely on browsing it. Others might be comparing many websites at the same time. And so, you could assume that they will not want to spend much time finding out about your deals. In fact, they’ll want to know about them right after landing on your site. 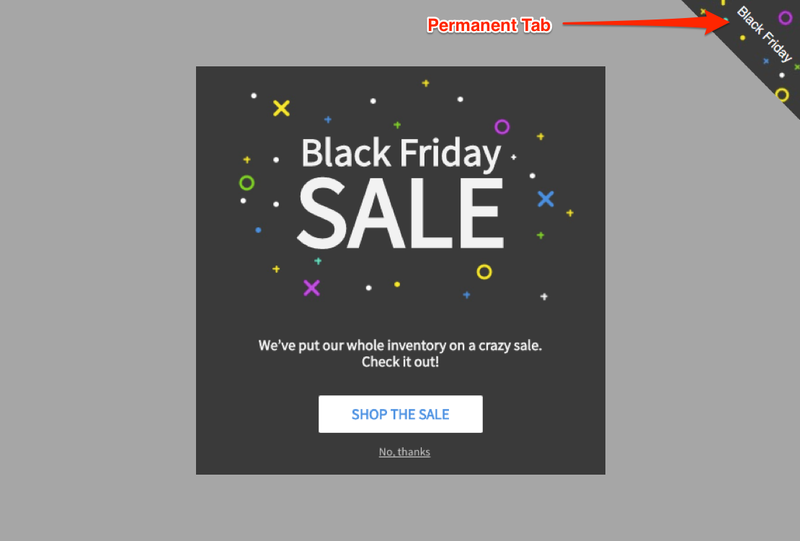 So, set up a popup that will tell every new visitor about any deals you have and point them to your Black Friday deals page. To make the most of this strategy, set the popup to target all visitors and display it immediately after they land on the site. This strategy is particularly useful when you’re trying to convert visitors comparing deals on many sites. A person who’s visited your site more than once within a couple of days is most likely considering buying from you. It’s just that, perhaps, they need you to offer them an incentive to seal the deal. And luckily, that’s not difficult to do. Show your visitors an exit popup displaying an additional deal on top of your Black Friday discounts – an extra coupon code, free shipping or another incentive. To make this strategy even more efficient, display the popup only to people who have visited your store in the last 24 hours. This way, you could target anyone who’s already been comparing websites ahead of Black Friday. Visitors often dismiss them without even looking. And that’s hardly ideal when you’re trying to ensure that Black Friday shoppers learn about your deals page, right? Luckily, you can still tell them about it, even if they’ve closed your popup. How? By allowing them to bring the popup back. Apart from creating a popup, you can also launch what’s known as a Permanent Tab – a small call to action you can place in different locations on the screen. The tab works just like any button, activating the popup. Any visitor who has closed the popup could still bring it back by clicking on the tab. 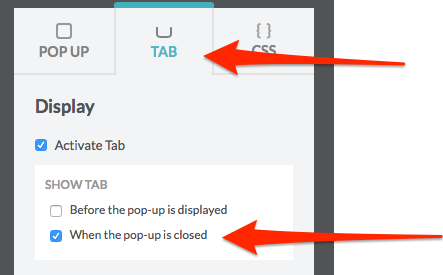 Go to your dashboard and select the popup you’d like to use the Tab for. Click on the TAB part of the interface to activate its settings. Set the Tab to display when the popup is closed. You can also specify the position of the tab, its size, and copy. But the most important thing is to set it to show after a visitor has clicked the popup off. Let’s be honest: Stopping shoppers who are in a rush and convincing them to buy from you is one heck of a challenge. But unfortunately, it’s not the only one you’ll have to face during the Thanksgiving weekend. As people compare prices and deals on many sites, they tend to abandon shopping carts more often than usual. And so, you need to find a way to rescue those abandoned carts. Well, here’s a strategy that might help you. 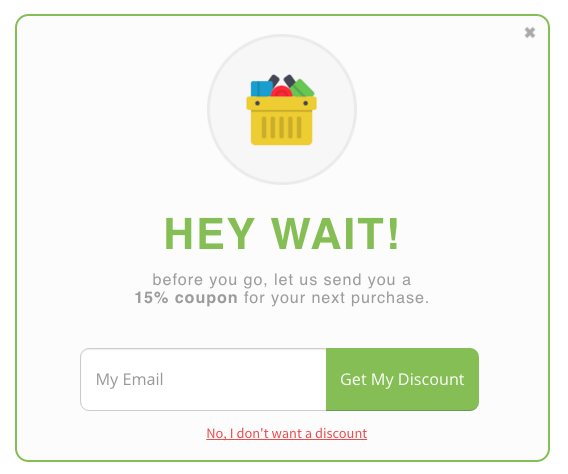 Display an exit popup triggered by someone’s intention to leave your site at the checkout, and offer them an additional discount in return for their email address. And once you have their email address, you can then set up various strategies to retarget them later, and entice to complete the purchase they’ve already started. Tell me, what’s the most frustrating part of shopping? I’d say it’s finding out that you actually can’t get the product you’ve wanted. Like, when the company notifies you at the checkout that they don’t ship to your location. So, to prevent their frustration, use a popup to notify shoppers of any limitations, shipping dates, and anything else that could affect their purchases. Similarly, if you’ve made changes that would allow more customers to buy from you, use a popup to let them know about that too. This simple popup will immediately improve your customers’ experience, increasing the chances they’ll actually buy from you. 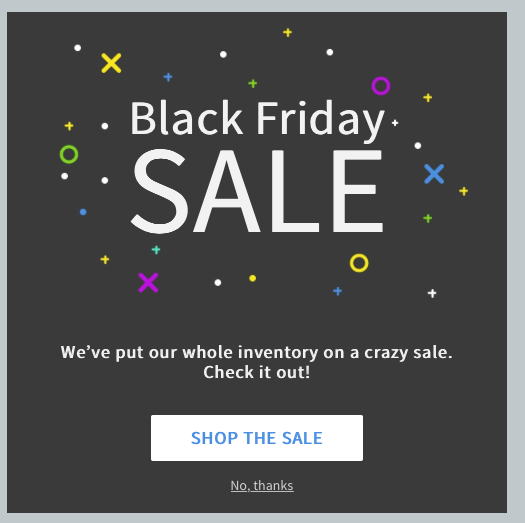 Ready to Boost Your Black Friday Sales with Popups? Click here to learn more about Wisepops.